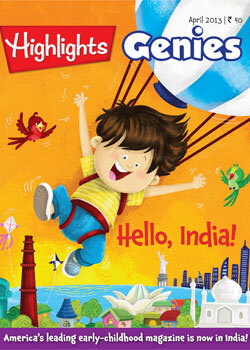 If you are looking for magazines for kids aimed at early childhood years, do not miss Highlights Genies. When it comes to buying magazines for kids, there is not much options available for the young readers, i.e. early childhood kids. ECH is a fast growing phase and the kids tend to learn a lot during this phase. Among the few magazines aimed at Early Childhood Education and entertainment, Highlights Genies is right up there. Rather, a high quality and highly engaging magazine for the kids. Imparting creativity in children, especially in the preschoolers and kinder garden kids may not be such a big deal. Being very versatile, the kids tend to celebrate their childhood when they are provided with the right tools. Highlight genies is one of the best things you can gift your preschooler to nourish their early childhood. Designed for kids aged 2 to 6 years, the magazine is a lot of fun for kids. Besides, it also helps the little ones to develop the necessary skills and gain knowledge that they require in the primary school. The colorful magazine is designed by the experts specialized in child education. The magazine has multiple segments encouraging the natural sense, reasoning ability, communication, self-motivation, expression, creativity, problem solving ability and much more. Just like some staple and popular characters, Highlights Genies has some special trademark characters. They are Tex, India, Kiran and Meera. These characters are adventurous, source of encourage, fun and entertainment. There are a few interesting parts in this magazine. Kids of all ages (even adults) love the picture puzzles. The magazine provides interesting, easy to solve picture puzzles. Simple activities with systematic instructions and pictures are yet another interesting segment. How to grow your own veggies, how to make a clay dough, how to make a pizza or a pie – kids find them interesting. Another intriguing feature of the magazine is ‘That’s silly’ page! The concept is finding the silly or funny activities. Just as freebie, cards, cutout papers, mini toys are provided with the magazine. The cards and cutouts can be used to play games, create stories, make crafts, etc. Don’t miss buying this magazine for your toddler! Visit us to know more about the must to have magazines for kids.